Last copies available directly at the label. Sleeve design/letterpress by Ben Owen at Middle Press, Brooklyn NY. Francisco Meirino&apos;s An Extended Meaning For Something Meaningless uncovers deep hidden contexts from the decaying fringe of the auditory spectrum. Here we find ornate beauty in the subtle demise of electronic systems and explore the arcane apprehension of existential degeneration. 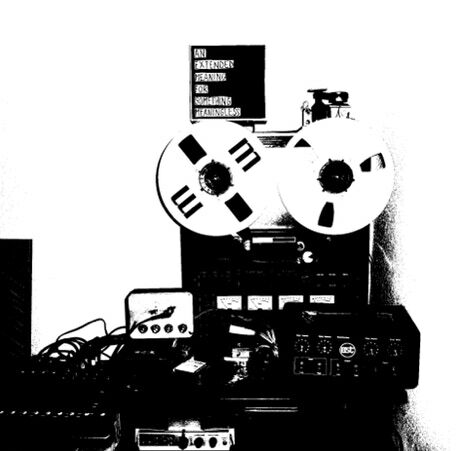 The recording looks at how to create something out of almost nothing—basic field recordings, static electronics and failed tape experiments. A 16-channel multi-track piece where reel-to-reel tapes juxtaposition with modular synths, laced in a world of field recordings from late night Osaka to hydrophonic sewers. The work consists of three untitled tracks with a total runtime of just over forty-four minutes and comes packaged in a letter-pressed sleeve printed by Ben Owen of middle press. The audio captures of Francisco Meirino in An Extended Meaning For Something Meaningless become almost inessential – in this case the experimentation is focused on the audio spectrum: the electronics here are static and immanent, with slight vibrations and whispered undertones performed by an artist who doesn&apos;t appear to be searching for something particularly essential and specific. The project is articulated in three tracks with no title and lasts about 44 minutes: it is based on the use of tools such as computers, piezoelectric sensors, tape recorders, modular synths, field recorders, electronic instruments and self-made electromagnetic sensors. There is a large range of sound elements: glitches, buzzes, metallic sounds and other singular audio emergencies: in some ways it works like contemporary cooking wherein something with a soft consistency and an involving taste is juxtaposed with more hard and crispy elements. Fraying sounds slowly dissolve, as fragments of memory that make this process of dissipation slow, however raw and expressive: the process constantly recalls a proud form of degradation, that we define magniloquent in its tangled composition. Compelling low frequencies, sharp hisses, crackles and winces are all to be found in Meirino&apos;s collection, who juxtaposes the sections with great taste, skilfully arranging the main layers into charming polyphonies. Somehow he conceals the structures thanks to some meticulous "artisan" art. As a result, this work transmits a sense of frugal grace, a presence assembled with few, but vital elements. Nouveau solo de Francisco Meirino, publié en CD sur le label Audio Field Theory, avec une belle pochette imprimée par Ben Owen, An extended meaning for something meaningless regroupe trois pièces électroacoustiques. Le compositeur suisse utilise ici un gros set composé d&apos;un ordinateur, de piezzos, d&apos;enregistreurs à bande magnétique, de synthé modulaire, de field-recordings, d&apos;électronique fait maison et d&apos;ustensiles électromagnétiques. Trois pièces qui ne se basent pas sur grand chose : un léger larsen, des field-recordings basiques, des microcontacts, etc. Et pourtant, à partir de ces bases qui peuvent paraître pauvres, Meirino parvient à construire une musique riche, profonde, et dramatique. Le compositeur joue sur la tenue de sons qui acquièrent une profondeur émotionnelle au fil de leur déroulement, le son n&apos;est pas forcément très riche, mais sa durée le rend petit à petit de plus en plus présent, de plus en plus intéressant et profond. Bien sûr, la modification de chaque source est belle, précise, technique - mais ce n&apos;est pas forcément le plus intéressant, même si le son de Meirino est assez personnel. Ce que je trouve vraiment bon sur ces trois pièces, c&apos;est comment Meirino parvient à immerger l&apos;auditeur (de force presque) dans des sons qui ne paraissent pas exceptionnels au premier abord. 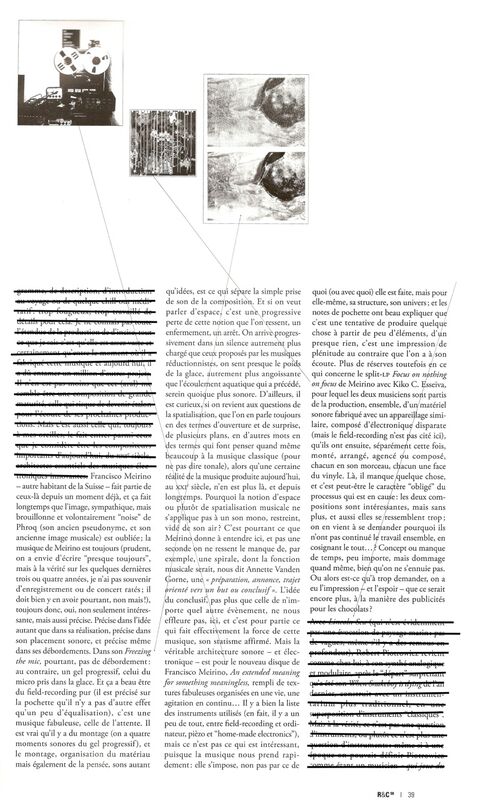 Meirino utilise des sons assez simples, épurés, des fréquences granuleuses, quelques vagues modulations, des field- recordings rustres, et c&apos;est tout. Mais dans la durée, on finit par s&apos;habituer à ces sons, à les prendre en sympathie, à tenter de les comprendre et à ressentir de plus en plus ce qu&apos;ils peuvent exprimer. La musique de Meirino a quelque chose d&apos;une sorte de musique électroacoustique minimaliste et romantique : c&apos;est simple, précis, mais plein d&apos;émotions et de force dramatique dès que l&apos;on rentre un peu dedans et que l&apos;on accepte de s&apos;immerger dans son univers. Bon travail. More music by Francisco Meirino, whose work becomes more and more interesting. He works with the lowest means: some field recordings, static electronics, reel-to-reel recorders, modular synth and electro-magnetic sensors. His latest work, consisting of three parts that make up one pieces, began life as a fourteen speaker installation for a festival, but was later edited into the three pieces we hear on this CD. Meirino&apos;s work is loud and no doubt could easily be classified as &apos;noise&apos;, but the truth is that this is hardly &apos;noise&apos; in the classical sense of the word. It uses elements from the world of noise, but due to the fact that nothing lasts very long plus the fact that this is collated together in the form of a composition, makes this perhaps more a musique concrete release, and rather not mindless long, numbing walls of noise. Here something is though out, planned, and constructed, using the raw building blocks of noise music. Meirino&apos;s work is far from pleasant, as it more often sounds like walking in a contaminated waste dump with leaking barrels of radio active material, and nearly defunct machinery which was original there to destroy the waste. Francisco Meirino is the composer formerly known as phroq; in the past two decades, he&apos;s released over a hundred solo and collaborative ventures. After such achievements, most performers would be content to rest on their laurels. Not so Meirino, whose new work continues to display innovation. Because this latest album sounds so contemporary, it would be easy to mistake it for the work of a younger man; instead, it reflects the wisdom of experience. On the surface, An Extended Meaning for Something Meaningless is an electronic album, but to classify it as such would be to sell it short. It&apos;s not an album to which one might dance, groove, or nod one&apos;s head. Instead, it&apos;s an exploration of electronic timbres, fleshed out with field recordings and reel-to-reel tapes. Auditory Field Theory describes it as inhabiting "the decaying fringe of the audio spectrum", but in the hands of Meirino, decay has seldom seemed so alive. The three untitled tracks, especially the first and third, are packed with pops and hums, metallic pings and modular notes, like a sonic dumpster in the midst of being overturned. Ennio Mazzon is an obvious relative, as is Robert Hampson; Meirino is in good company with such contemporaries. The irony in seeking to capture the sound of decay is that once it is captured, it is preserved, and as such it is no longer decaying. This album might better be described as a snapshot of decline. The reel-to-reel falters, and in its faltering lies its beauty. The field recording grows corrupted; memory splinters and fades. The middle piece seems to contain the sound of a film projector on its last legs, turning without image as traffic passes outside a neglected theatre. In the alleyway, ravenous dogs scrape the metal lids from garbage pails and search inside. The title comes across as sardonic; once meaning is provided, the meaninglessness dissipates, providing another form of decay. From the decaying fringe of the auditory spectrum we find ornate beauty in the subtle demise of electronic systems and explore the arcane apprehension of existential degeneration. At the risk of sounding harsh and irrelevant I&apos;ll begin by asking what the first paragraph actually means. Answers on a postcard please. If an artist is going to preface or interpret their work by means of text, then surely the text is to be taken seriously. So the subtle demise of electronic systems and the arcane apprehension of existential degeneration either means something very profound which lies beyond my understanding, or the intention is poetic, or the words have been thrown together because they look good. The second and third paragraphs make sense, though Meirino could have done himself a favour by placing himself firmly within a strong tradition and pointing out that making something out of meagre resources has been a staple of experimental music production for several decades now. For the first few minutes, apparently, there is a lot going on, a busy and complex sound world seems to be emerging, but on closer listen we discover a mix of the same sounds throughout with some modulation in the looped-sounding passages and contrasting gristle in the concrète sounds. So for the most part we have the illusion or semblance of complexity arising from two or three fairly simple and distinct layers. Then things break down and recommence with more layers. There is an intriguing feeling of agency about the music, in the sense that someone is playing instruments. This contrasts well with what I assume are the field recordings, which have a different semiotic content and which therefore send out a different message. I couldn&apos;t hear any evident relationship between most of the layers so I assume the composer is using the material in contrasting ways, which is reasonably successful on the whole. The piece is enhanced by the contrasting use of various sudden cuts and passages of relative calm which create pace and flow. Overall the use of similar sounds which don&apos;t develop or evolve run the risk of becoming monotonous. Here we have a consistent sound world made up of some reasonably interesting sounds but also of some rather hackneyed sounds, very few of which show any depth of sonic investigation. The primary layers consist of various multi-part polyphonies with added modulating material, which gather interest by means of some very good passages of contrapuntal craftsmanship. I sensed a lack of concrete sounds earlier on which would have created a more &apos;material&apos; base from which to develop the music. When these do appear they are confused by the appearance of other less effective sounds which clutter the frame. Some passages of hiss and flutter and interference with the more indeterminate low midrange timbres could maybe have offered a platform for deeper investigation. Nonetheless these are, to my ears, the strongest passages of the album. With this track you get lots of music for your money. Industrial processes are carried out industriously, there are some intriguing instrumental timbres near the beginning but never fully developed as the piece goes the way of the previous two pieces, favouring timbrally simpler crackly and hissy sounds. However this track does offer at times an excellent full- spectrum field without overloading the ears. The piece is punctuated by quite sudden though finely crafted dropouts, perhaps a deft use of dj skills. As it goes along the music becomes more evidently linear despite the impression of complex polyphony. Again Meirino manages to convey a wonderful sense of agency at times, the sense that someone, not a machine, is playing this music. That would be the strength of the album as a whole. Une pièce en trois parties composée dans le studio de l&apos;auteur en 2012-13 avec l&apos;utilisation de bandes magnétiques, de piezzos, de capteurs électromagnétiques, d&apos;enregistrements extérieurs et de synthé modulaire. Une cuisine interne qui tends à devenir la marque de ce compositeur toujours à l&apos;écoute des parasites et en quête de vibrations électriques. On pourrait imaginer ce disque comme une nouvelle musique paysagère prenant comme objet d&apos;observation le monde de l&apos;électricité. Un très beau disque - donc fortement recommandé - dans une pochette carton artisanale.